Dozens of young leaders in STEM — some as young as 5 years old — presented their climate change projects to more than 200 people during the STEM Education Innovation Alliance at the State Capitol Wednesday. Gov. Jay Inslee spoke to the standing room-only group, saying the passion and curiosity of science, technology, engineering and math students will lead the way on climate change. “There is nothing more important to the dynamic, creative, innovative economy in Washington than the work done by people in this room,” Inslee said. Students gave presentations on topics such as fish hatcheries, healthy soil, beaver activity and habitat, breathing clean air, saving the Southern Resident orcas and even how climate change affects Capitol Lake. A group of kindergartners discussed different species of trees and their inhabitants, and then showed the audience how to plant a tree. The students traveled from Colville, Colton, Tacoma, Ellensburg and Shelton, among other communities, representing 14 schools. 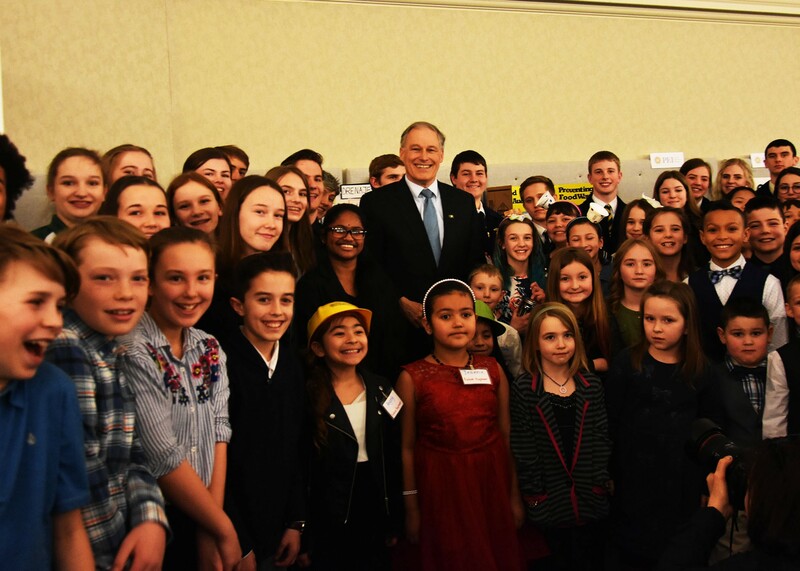 Inslee made his way around a crowded room, meeting students and asking questions about their poster board projects and visual aids. Inslee’s proposed budget for 2019–21 would support STEM students in many ways: have grant funding for climate science education, offer free college tuition for eligible students, expand career-connected learning for kids who want to learn STEM industries, offer grants for computer science and build better access to broadband services. Michael Meotti, executive director of the Washington Student Achievement Council said the students offered some of their best work during the event. Washington is consistently ranked as the best place to work and do business, and it ranks as No. 2 in STEM job concentration. 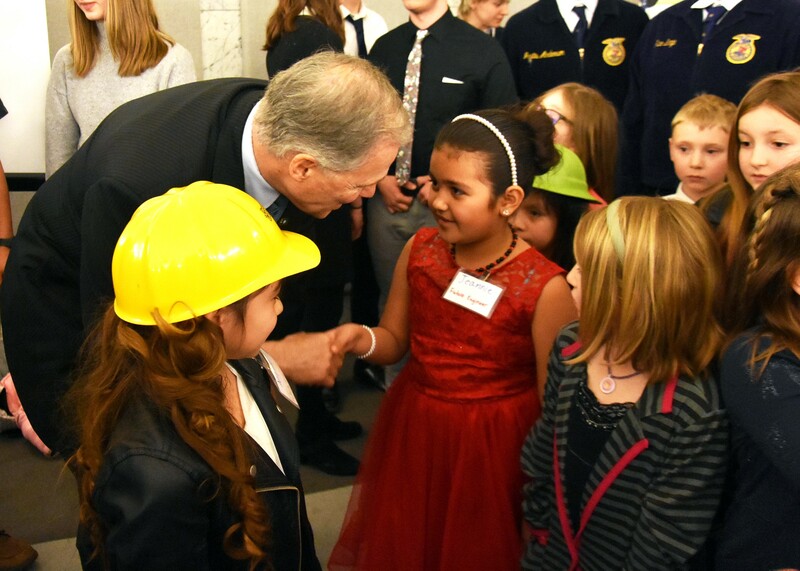 Inslee said although STEM is strong in Washington, the state needs to raise the expectations to expand STEM programs to all kinds of students. While the number of higher education STEM graduates in Washington rose from 22 percent to 28 percent, the percentage is still too low to meet workforce demands. A gender imbalance in STEM achievement widens as students advance in their education. Although girls tend to perform as well as boys do in math, the interest and achievement among female students fades the older they get. Students from low-income and underserved minority family also are at a STEM disadvantage. Inslee highlighted a grant program that has already resulted in a 600 percent increase in the number of high schools students who take AP classes in computer science. The program currently provides a $1 million dollar grant to schools that then gets matched with private money every year. The governor now wants to triple the grant program from $2 million to $6 million per year, and allow any low-income district that has more than 60 percent of free-or-reduced lunch not have to qualify for the match funds. The 2018 AP exam rates for Washington students in STEM classes exceeded the national averages in seven STEM subjects, according to the annual STEM Alliance report card. During the event, the governor referenced the power of the recent pay raises funded for Washington teachers, saying they could help the state retain teachers for longer periods of time instead of losing them to tech giants like Microsoft and Amazon. Appointed by Inslee, the alliance is composed of state STEM education leaders. Legislation passed in 2013 that established a multi-sector STEM education group to align education and career training systems with Washington’s technology economy.